I started doing Gymnastics at a very young age. 1995 I represented South Africa at the Junior African Championships in Namibia where our team achieved first place. In the same year I also represented South Africa at the Senior African Championships in Zimbabwe where our team achieved First place again. 1996 I became the South African Champion. 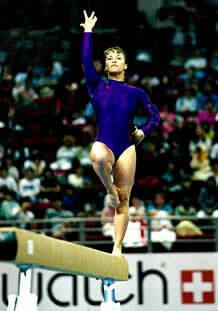 1997 I was the only lady Gymnast to make the team to the Gymnastics World Championships in Switzerland. Due to a knee injury I could unfortunately not participate. After Recovering from my knee operation I went on to represent South Africa at the 1998 Commonwealth games in Malaysia and the 1999 Gymnastics world Championships in China, as well as The African Games in Johannesburg. I started teaching pre school Gymnastics in 1999. In 2005 I started the Tiny Tumbles Mommy and Me program and to date the program has grown well, showing that both the moms and their kids love their physical activities at Tiny Tumbles.